In the past, when dogs wounds or contacted diseases that affected the front or back part of their body they had to go through pain for a long time or could never recover from the illness or injury because they might never get active again. But, everything is changing with the development of dog wheelchairs. Wheelchair supports their hind legs and enables the dogs to use the front to play, run and get the support and exercise they needed to live a happy and healthy life. Even paraplegic dogs can now use the wheelchair and remain active. Occasionally, dogs tend to develop arthritis, broken bones and ruptured discs because of an accident, neurological diseases, and even some inborn deformities. When such a condition is properly detected in advance, you can avoid the situation from worsening by giving your dog a wheelchair. Dog wheelchairs also maintain your dog’s energy and vivacity. Being disabled can drive your dog to extreme depression. This can be evaded or reduced by connecting a wheelchair to your dog. It would be a rewarding experience to have your dog with you on your morning leisurely walk or during any other physical activity. So, with wheels, your dog can keep on going about its typical routine and also reduce its boredom. 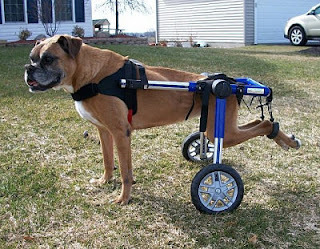 With wheelchairs, you can assist your dog to cope with his disability more easily and regain its lost mobility. There is no cause to panic right now when your dog experiences a sore back or crippled limb injury. A wheelchair can totally change your dog’s life and restore lost freedom. Also, a wheelchair guarantees that no further harm is caused to the dog bones and joints. It also helps in harmonizing the muscle and aids exercise as well, thus reduces the disease from further aggravating. It brings back the smile on your dog's face making it cheerful as before and in the process helping your dog regain its lost energy. Lack of movement can drive your dog into misery. By giving him a wheelchair, you can reduce depression and boredom as it can proceed with it everyday activities as before. Dog wheelchairs usually consist of harness, wheels, frame, and seat to support it. A few wheels also come with extra features such as counterweights and stirrups. In the case of injury to any of your dog's limbs, these components can help maintain balance. It provided an adjustable belt that helps the dog to fit perfectly on its wheels. A back support seat will give support to your dog back and as well gives grasp to the underbelly. Some of the best wheelchairs are the ones that make easy for your dog to even swim in the water. Therefore, when purchasing a dog wheelchair, make sure that all the features mentioned above are in place. Wheelchairs with a poor design can result in an increased risk of more damage, so it is okay to go for a better quality wheelchair for your furry friend. Therefore, make the most of it and get back the lost joy in the life of your disabled dog.